We don't get out to nicer places as we used to. In Vancouver we were out upto 4x a week. With two kids under 3, it's alot to ask of a grannie nou nou. In any case, when opportunity comes knocking, we make it happen. We got Gala tickets to TIFF (Toronto International Film Festival) this past weekend so I decided to make us dinner reservations at a Susur Lee restaurant too. Madness I know. What restaurant even remotely near TIFF would have tables available on a Saturday night right? Well, not many. So I booked at Bent, the sons' restaurant a bit further away. We love the food there. That said they had changed the menu and D was disappointed when I told him. But in the end it didn't matter because our Movie ran longer than we had anticipated with the speeches from TIFF, the director and the primary actors. We stood out on the busy King Street TIFF zone at a loss of what to do. We wandered over to Lee, hoping for bar seats. They were full for another half hour even at the bar so we decided that we'd try the other restaurants on that intersection and if nothing, we'd head home to a west end place. Valdez was full and Buca had already gone too bar-ey. We stumbled into Portland Variety because it looked the least busy. That said they were packed but the least packed. I was unarmed with reviews or writeups. In fact, when the hostess sat us at a last minute, early departure, and she asked how we heard of them, I said, honestly, we stumbled out of TIFF without a plan. We took a peak at the menu before being seated in case it was an all steak or charcuterie place that I would not stay for. It was tapas. Now, if you're a regular reader, you'll know a couple of things about me and Tapas. 1. I lived in Spain for over 2 years so I know a thing or two about Tapas. 2. I am annoyed by Western restaurants over charging for small plates under the hospices of Tapas. The second is particularly irksome because it goes against the very spirit of Tapas. Yes you can get expensive food in Spain but it is very high end and usual the size of a substantial main and you aren't paying for Pan con Tomate. But when you charge high end prices for what should be casual fare.. booo and then list yourself as moderately priced because each dish is less than a 'real' main, I'm going to be bothered. I call it 'Tapa' fatigue. That said, it wasn't a charcuterie so we stayed because I was starving. Glad we did. I stayed when I saw Cassava fries on the menu. More South Am than spanish, but we honeymooned in Ecuador and Cassava or Yucca was everywhere next to corn so Yummo! We sped ordered, the guy came over to say hello and I shot four orders at him. It was so busy that I thought it was the best thing to do. Yucca came first. It was piping hot, a tad on the dry side and there was no dipping sauce. Still overall, good but could have done with an Aioli or something. Next came the grilled Artichokes which I have not seen done properly since Barcelona and still haven't. They were the size of halve ping pong balls and under seasoned. Served hot, which I'm always happy about in a place where I'm worried that because of the crowds, things may sit too long at the pass. They did not. Still, it was a meagre plate, so I started to worry. Then came the Garlic Shrimp in Pil Pil sauce. OUTSTANDING. I mean OUTSTANDING. I have not been that please with a dish in a restaurant for years. 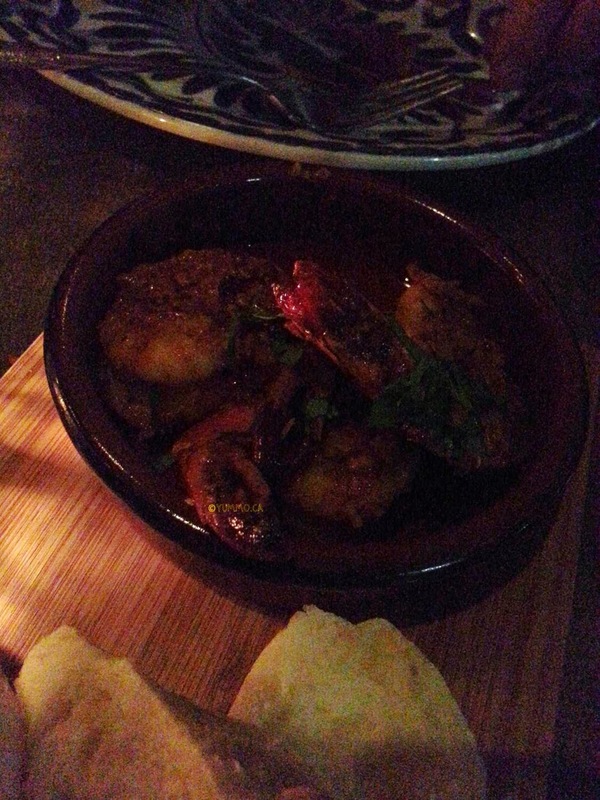 The flavours, the spice were great and the Shrimp where cooked perfectly. We were sopping up the oil with the bread, which we had to go out of our way to ask for. D had half a Cornish Hen with Piri Piri sauce. He dipped his fork in the sauce and smiled. We'd recently had some bad store bought Piri Piri and this was miles above. We will never touch that jar again. As his Hen arrived I noted the table nearby received their Marrow. Now I am not a fan by any stretch of the imagination but D is and he rarely gets to have it. It was a nice portion cut along the length and I told D he should order it but thankfully, our server did say it would take a while and knowing we had not alot of time, we decided to wait for next time. Our last dish was the Brandade which we make very well from scratch at home. We scraped every molecule from the bowl. It was very good. It wasn't overly Potatoey, which lots of restaurants do to 'stretch' the saltcod. It was piping hot. Our meal was eaten with a decent Garnacha. They ran out of glasses so we did wait abit. That said, they had only opened a few months ago so perhaps a bit ill prepared for the TIFF onslaught. I saw a table outside had ordered the Patatas Bravas and they looked delicious. I know already, what I'll be ordereding next time. Now, I have no idea why this place is called Portland Variety except for the 1890s style aprons and bowties on the servers. But the food was excellent, service congenial and we'll be back. 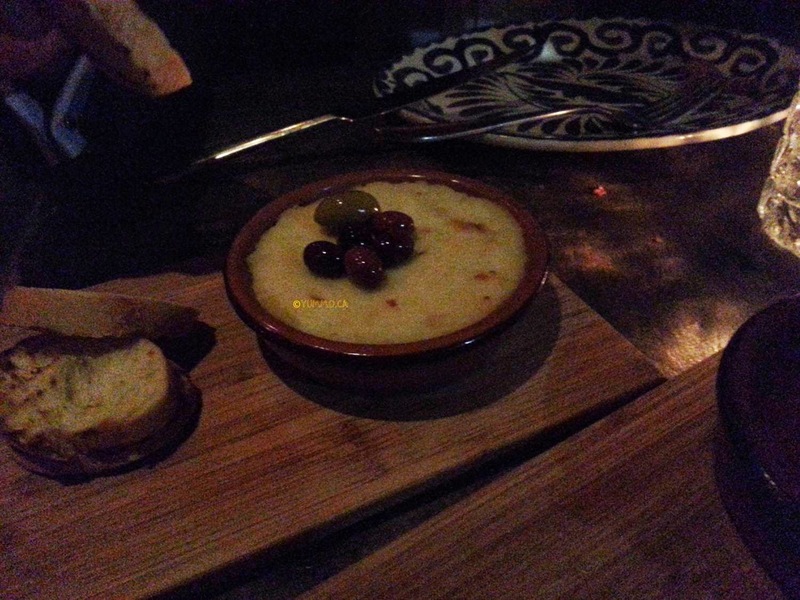 I enjoyed the Tapas here more than Patria which we visited a few months ago. Ambiance: modernised deli upfront and typical King West buzzy in back. Family friendly: maybe during the day, tables far too close together but bathrooms are on ground level!!! .... then thankfully snapped back to reality. That's to say, I had the night off. Hubbo watched the kids while I went to dinner with my cousins for a Birthday. They were once regular denizens of King West but at a much later hour :D As the birthday girl put it, there wasn't a place she paid cover or didn't know all the door staff. Well, we discovered rather bluntly that nothing has changed but the price of the drinks but I'll get to that. I really didn't know that Brasaii turned into a club after dinner. The other girls started with the Steak Tartar which was soon swept clean. I started with the poached Lobster. It was the ideal portion for the course and the price. It was very well cooked. Tender and not at all rubbery. The flavours were subtle and bright. We accompanied the whole meal with several bottles of Whoa Nelly Pinot Noir. Given the likelihood of varied orders and a group meal, I find it easier for the palette and the next morning not to try to change wine orders throughout a long meal. As we started our appetizers, we were offered a complimentary glass of sparkling wine for the birthday. The bread was constantly refilled which was refreshing. Much different from Patria last week where they charge you 6 bucks for two slices of bread with oil. The bread was warm Rosemary Wholewheat baguette or classic white served with whipped butter. I kept snatching the Rosemary from the baskets. mmmm Thankfully because the interlude was exceptionally long. Even the most laid back at the table were starting to get antsy. At first I had thought it was because not everyone ordered a starter but no, this was far too long a pause. The water was not refilled as we waited and we didn't see our otherwise gracious server for quite some time. Next up, I had the Scallops sans the Lamb Bacon. 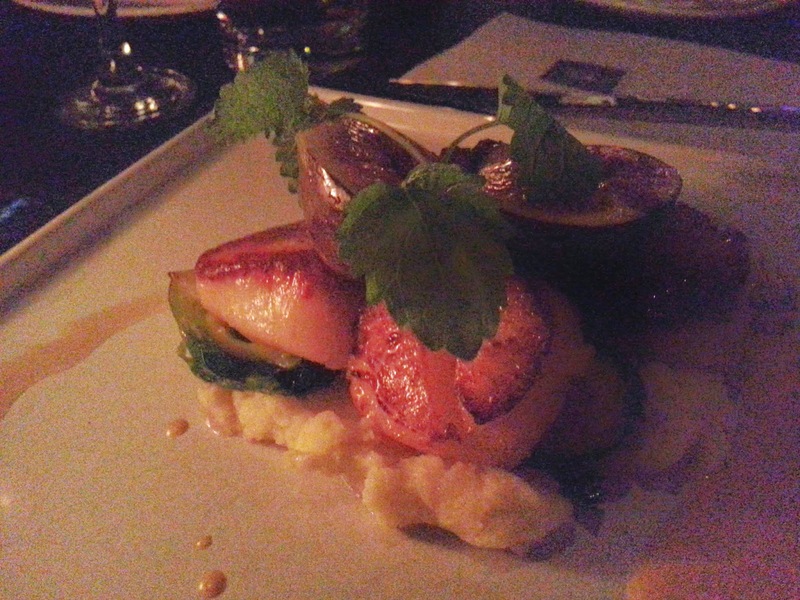 The Scallops were perfectly cooked and well seared. The Brussel Sprouts, the reason I ordered the dish, were yummy. The Figs were nice because I like figs but they were seasoned or dressed and were just sort of perched there on the plate. I didn't think they were necessary but glad to have them. I was worried about the substitution but they were happy to accommodate. S had the short Ribs, I tried her Potato 'nugget'. It was very tasty, and crisp. It was a tad on the 'tot' side for the style of restaurant but I liked it. I took a poke at H's Orecchiette pasta. I dodged the Sausage bits but I wanted to see how they cooked their pasta. It was perfectly cooked and it had a nice chewy bite. My only complaint about the main was that everything was hairs breath away from being COLD. My dish was room temperature at best. But we'd waited so long for our food, I dared not send it back or I'd just have it nuked or wait another half hour. Where did we land? Well, the DMZ I guess. Keen observers who have either moved on from this scene or are into a more laid back night out. Still it was fun to be out with the girls. I left around 2 and there was still a line up. King West was a parking lot. I'd recommend you make transportation plans ahead. Don't catch your cab on King West if you don't have to. Hop over to Spadina or Richmond. 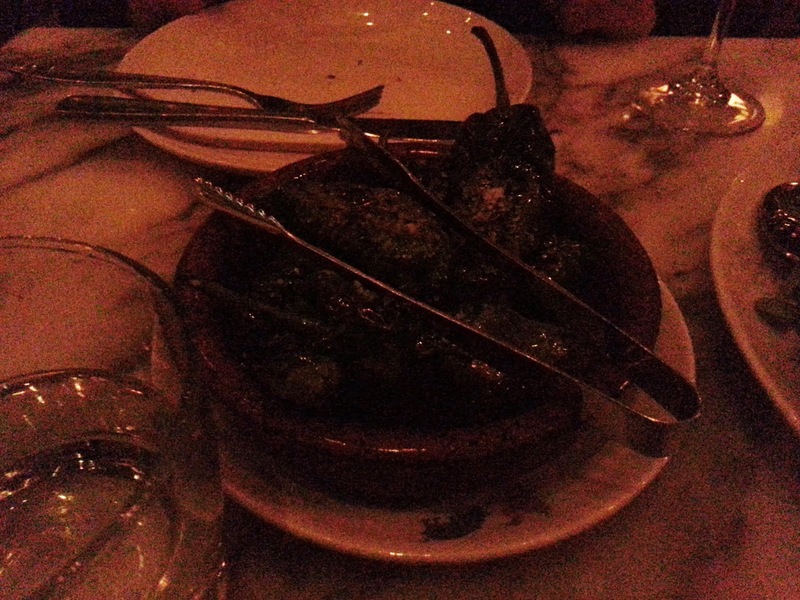 Not Quite a Taste of Home - Patria Toronto - Spanish "Tapas"
Pimientos de Padron - Patria Toronto - Tapa staple! My cousin H offered to babysit for us so we could have a real anniversary dinner. 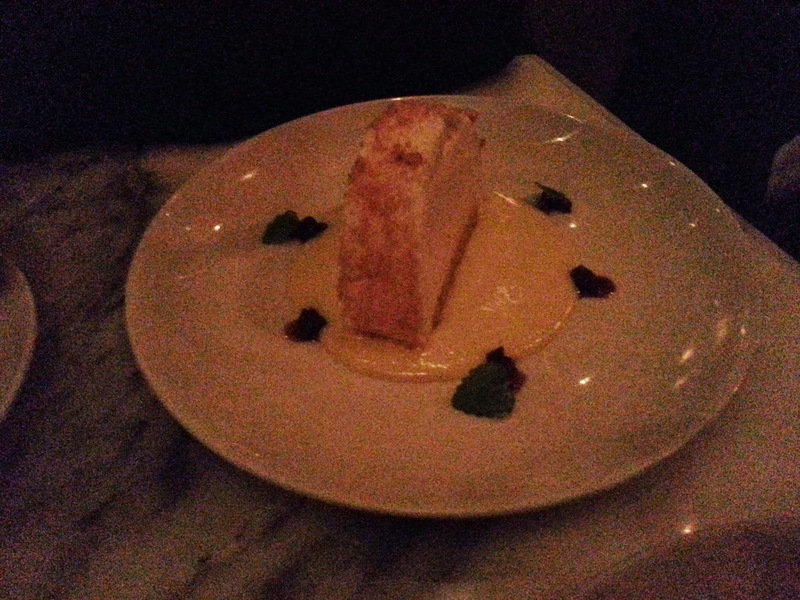 We ventured downtown on a Friday to eat at Patria after I saw them as a venue on Top Chef's Restaurant wars. Actually, a friend of mine from Valencia's brother in law recently moved to Toronto to escape the Spanish economy and is working here as an architect. He mentioned Patria and Bar Isabel as the places he thought had heard in his Spanish circles as being the most authentic as well. First thing's first, it is not easy to find. I think it's a bit ridiculous if the default way of describing the location of a place is to say it's down the alley from another place. Several different people refer to Patria being behind West Lodge. There is no sign on King St indicating where it is and their sign in front of their actual door, which is down a dark driveway that resembles a condo tower entrance, is practically invisible. On their website, they show a tall wrought iron gate with their name, which we did not notice. It was raining and dark, mind you and we had an umbrella. It has a vibrant interior with enormous paintings. We were sat in the smaller side of the dinning area on the east side of the bar. It was near the door and though there was a heavy curtain defending from the wind, it was still quite drafty. This end had mostly bar seating and bistro tables along a bench. The bench seemed sadistically and purposefully designed to be uncomfortable. It slanted away from the table and even if we pushed the table right up against the bench, I still felt I was miles away from hubbo and the food. So I sat perched on the edge of my seat. It seemed counter to the relaxed Spanish spirit of eating. I lived in Spain for 2 years. In a class on operation design, a professor asked me to describe my dinner out from the evening before. "We arrived and gave our name and waited. We went to the bar and waited for the bartender. We ordered drinks at the bar and we waited for the drinks to be made....." A Spanish classmate laughed and shouted out "it's called eating out". Whereas in the North American culture, if you watch any restaurant makeover show, if your clients wait for more than 10 minutes for ANYTHING, it's a failure. Not so in Spanish culture. It's all part of the enjoyment. Your friends and conversation are all part of the experience. So how was I supposed to do that perched like I was in an interview for 2 hours. The menu was split into cold starters and Raciones. I am quite bothered when people called what they had in the starter half of the menu as 'Tapas'. Those were Pinxos or Pinchos. I.e. one or two bites of something. For crying out loud, their bread was 6 bucks and you got two slices of a baguette. Do not call that a Tapa. Raciones were also misnamed. We ordered the Croquetas de Manchego which were fabulous. But they were really a Tapa and not a Racion. We received 3 tiny Croquetas the size of a man's pinky finger for 8$. 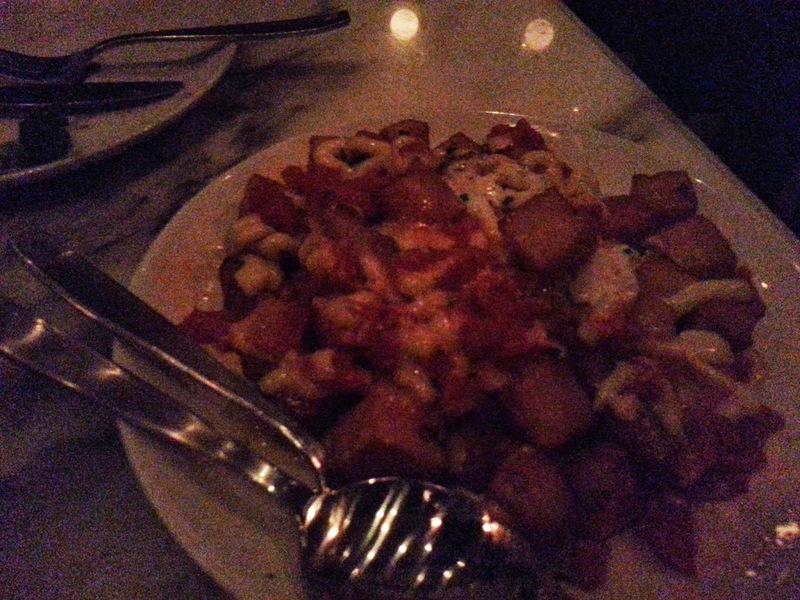 We also had the staple Patatas Bravas. They are to Tapas what Tamago (Egg Sushi) is to Sushi, a sign of authenticity and skill. I'm glad they came 3rd because if they had come first, I would have been dreading the rest of the meal. The Potatoes were tough, cool and over cooked. 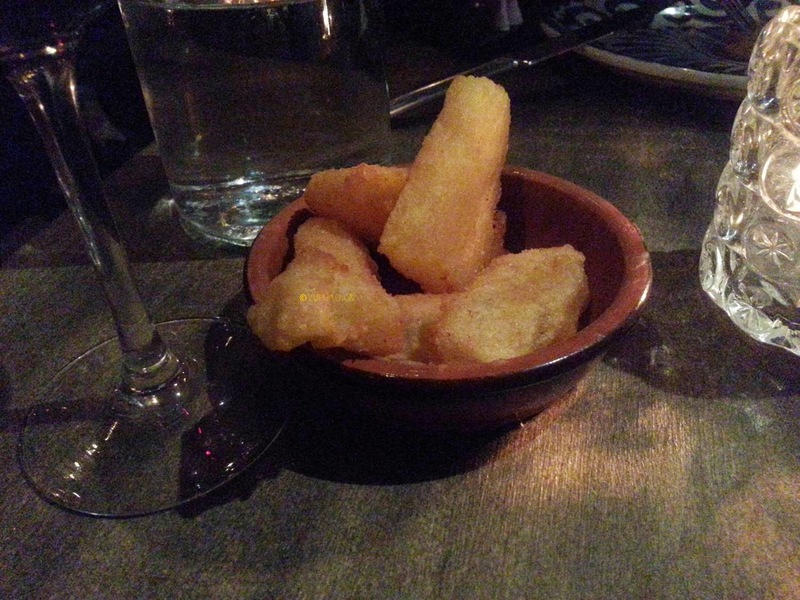 While that might be acceptable in an East Coast/ Central Canadian Chippie it is not in a high end Spanish restaurant. The tomato sauce was bland and flavourless. The Fried Egg on top was strange and having it chopped up at the table by the server rendered the dish grotesque and unappetizing to look at. The Porrusalda, or seafood stew was very good as well, though small for the price as well. I had at least 2 bad Mussels in it. 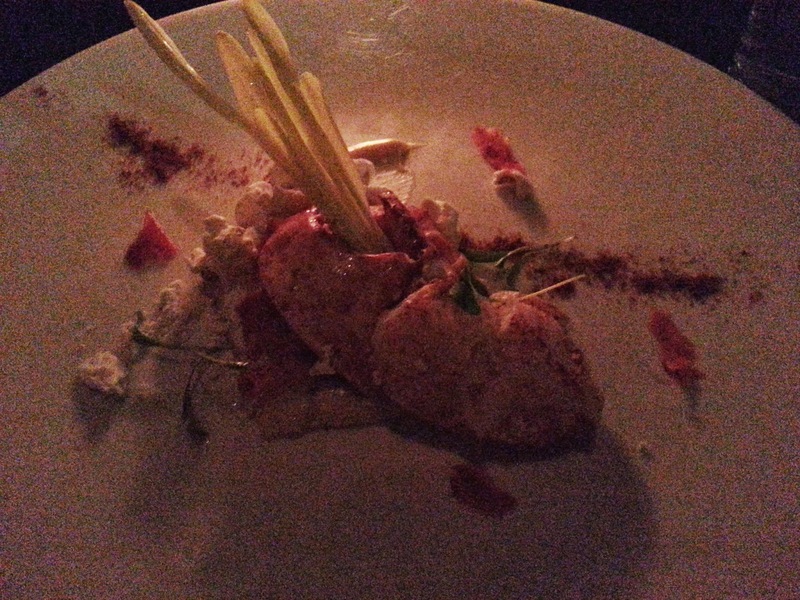 The Pulpo or Octopus was terrible, well, inconsistently terrible. Every other piece was like a piece of rubber. But they were all sat on tiny burnt coins of Potato. The Artichoke salad was nice and well dressed but the name was laughable because the Artichokes were poorly represented. There was probably more dressing than Artichoke. It was spread thinly across a large plate and looked a lot more bountiful than it really was and what I am accustomed to for Spanish salads meant for sharing. Oh, I almost forgot we started with the Piementos de Padron. They look like thumb sized Anaheims or Banana peppers. They are almost never spicy. They're blasted on high heat, whole and served piping hot with course salt. I love them and they were done well though a modest portion. A most for a Tapa dinner to be sure. They do have Paella on the menu but you are warned on arrival that it will take an hour. I think it would have been wise of the reservationist to make the offer to take a Paella order when I booked. Anyhoo, I'd been told by 3 separate people that their Paella was not very good so we passed on the 1 hour wait. The service was spotty. The server was spread thin across two sections bisected by the bar so we didn't see him often and grabbing his attention whilst near us wasn't easy. He was helpful and friendly when we saw him. He did forget my drink order which I cancelled as I'd waited too long and he offered me a compt drink as an apology without question. The desserts were good. I had the Mousse of Dulce de Leche and hubbo had the Lemon Mousse. The mousse on his dish was fabulous but it is described as coming on a piece of cake. To say the cake was a sliver would have been a gross exaggeration. To even advertise the presence of the cake was a waste of ink. Mine was pleasant but reminded me somewhat of a lighter Mars bar. The wine list is extensive though going on the high end of the multiple for restaurants on bottles on the 3 to 4x scale. If you are not familiar with Tapas the servers offer to select for your to lessen the burden of reading, as they put it. I was told by others they would offer. I think I'd rather they offer a prix fixe of types i.e. meatless or seafood only rather than leaving the pricey menu entirely in the hands of the server. 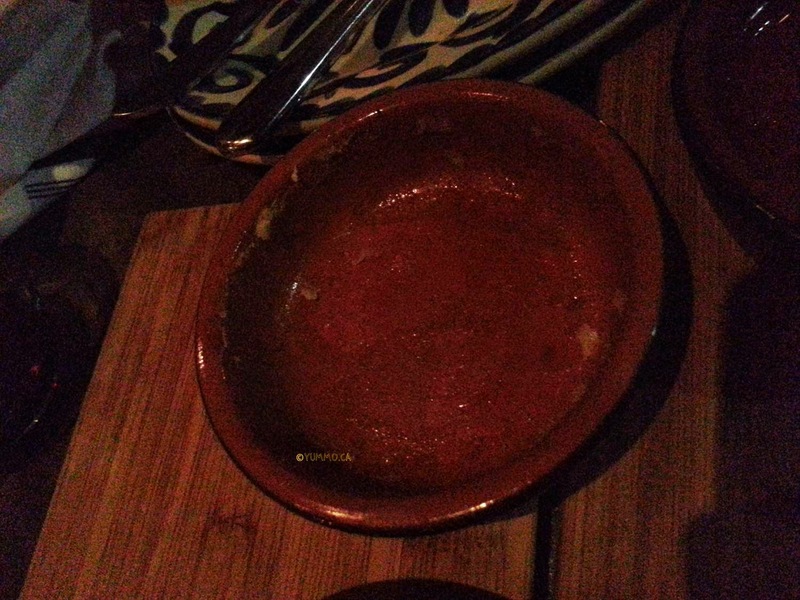 The food was good but far too expense and mean for what I know of Spanish food. I will try others on my quest to have a taste of my second home. 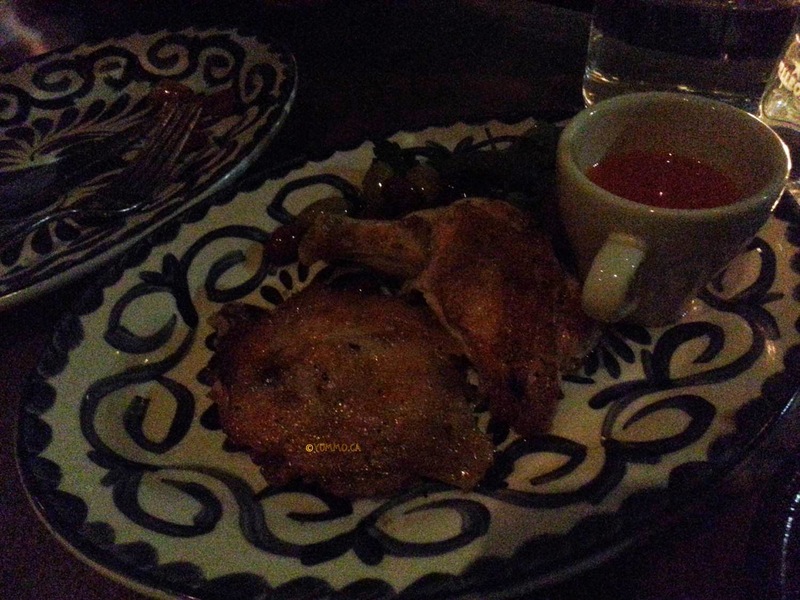 Ambience: cool, dark NY vibe, not so much Spanish tapa bar. I consider myself a self anointed Fish and Chip aficionado. 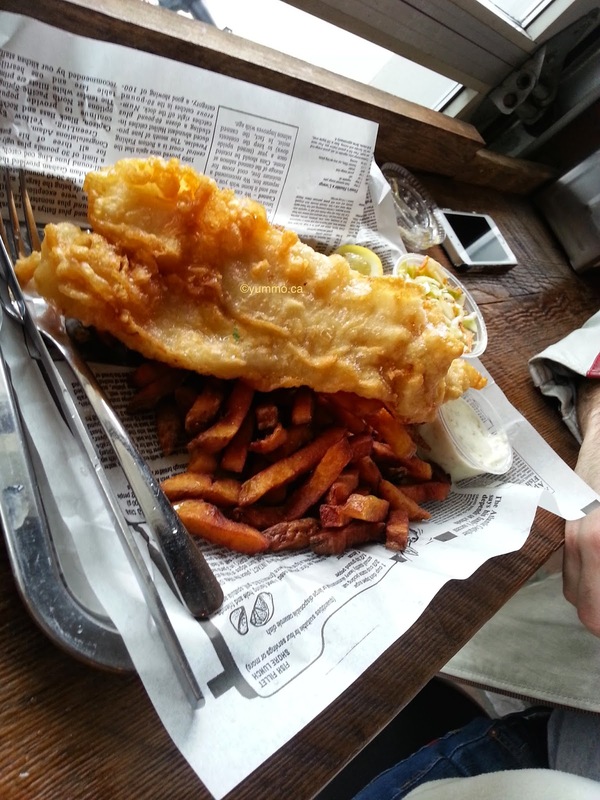 I've had some of the best and worst fish and chips all over the UK whilst living there and all long the pescatarian West Coast of North America and Maritime East Coast. Chippies as they're called in England, are an institution and a basic staple. Hence the saying 'cheap as chips'. 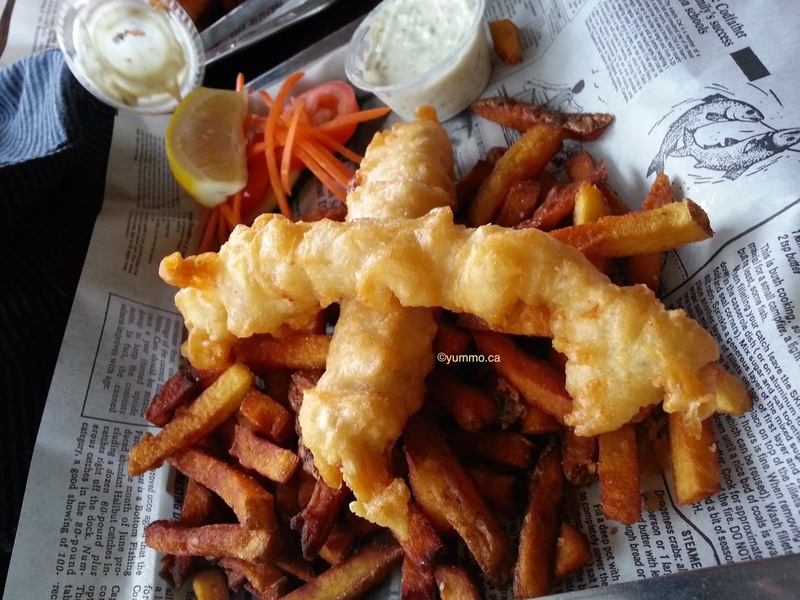 Having moved to Toronto from Vancouver, I've been rather disappointed in the fish and chips here that carry 'good reviews'. Either the batter is a soggy let down, the fish is a mealy, frozen disaster or the chips are a blackened dog's breakfast. I've come to accept that East Coast Canada i.e. Toronto and Montreal like their fries dark, fine. But that doesn't mean they need to be burnt, tough or cold. I'm talking to you Off the Hook. We've lived in Bloor West for a couple of years now. I've bemoaned the lack of places to eat but it's slowly evolving and we don't feel the need to go downtown or to Roncey all the time. The One that Got Away opened last year and I've not found the time to go between finishing up work for MatLeave and well, being pregnant. Finally, strolling around with the family today we stopped in since hubbo has told me I've been saying I would for nearly 6 months. Plus we had both kids with us and lil T will eat his Chips without complaint. I packed a lunch just in case. It wasn't needed. I'll cut to the chase now. The food was great! Admittedly it was on the pricey side and not your weekly Chippies because of that. I'd say, they are probably a mere buck or two away from being a weekly staple. Two, yeah, given the neighbourhood. Course, they could be priming themselves for the condos opening up soon and don't want to be seen to be gouging later, who knows. But for the folks Bloor West, deffo 2 bucks too pricey for it to be a regulars' spot. I got the Trout and Chips, D got the Cod and Chips with Slaw (which cost extra??) and lil T got the kid's sized Cod and Chips. The portions were all generous. I'd say the kids sized was an exceptional value. If I could, I'd order that as a lunch for myself. I wonder if I can. The fries were on the dark side but very fresh and fried to order. The batter was light and crisp and well seasoned. The fish was flakey and well cooked. The Trout was a treat. 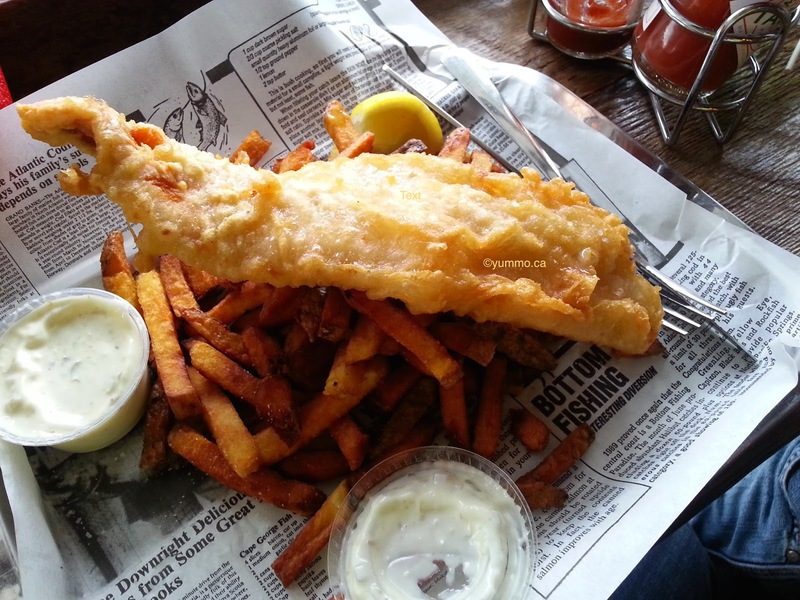 I used to love the Salmon and Chips out west and of course the farmed stuff out here doesn't cut it for me. Lil T ate almost all his Fish uncontested and wanted to eat more fries but he was busting. The kids plate comes with a little salad of Tomatoes and Cukes which he liked. The Tartar sauce was very tasty and I took it with us with the leftovers. The Slaw was light and tasty but it was a small portion. We sat at the bar in the window to watch the foot traffic. It is a small restaurant but the footprint of most of the restaurants in Toronto are not large BUT and this was a huge bonus for me, the bathrooms were at ground level and IMMACULATE. It only has 5 tables of two and bar level seating around the perimeter. I can only assume they want more takeout traffic. Which definitely calls out their pricing. They really need to do cones then because fries and fish will sog out in the boxes they have. I'd have loved to see Mushy Peas on the menu and see the Coleslaw included. I will go back. I must go on Wednesday for the Lobster Wednesday and likely a monthly Fish fix. Ambience: somewhere between pub and fast foodish. Nautical theme. Kid friendly: Yes. No step up at door for stroller, no double door, toilet at ground level, casual crowd and staff. 1. Location: Is it located on a streetcar line? Then it's not good for me. I don't drive and streetcars are NOT stroller friendly in the least. They are narrow and have no lifts or ground level entry. 2. Entry: Is the restaurant entry at ground level? or limited to 1 step? Does the entry have any annoying double door entry that makes it impossible with a stroller to get through? 3. Dining room: Are there enough tables and space between tables for you to roll a small stroller in and not hog too much room nor get in peoples' way. 4. Ambience: Is it too loud? People or music? Is the clientele likely to be annoyed should baby start to cry. I originally saw Bahnmi Boys on You Gotta Eat Here and was drawn like lemmings to a cliff by the promise of a Kimchee Poutine style dish. I'm not big on Bahnmi. Hubbo is and we'd been meaning for ages for him to try them because they're not as ubiquitous in Toronto as they are in Vancouver. We never get around to coming down on the weekends since there is so much to do with both the kids and ironically, it's easier for me to get down here on the subway than it is to wend our way through traffic with the car. 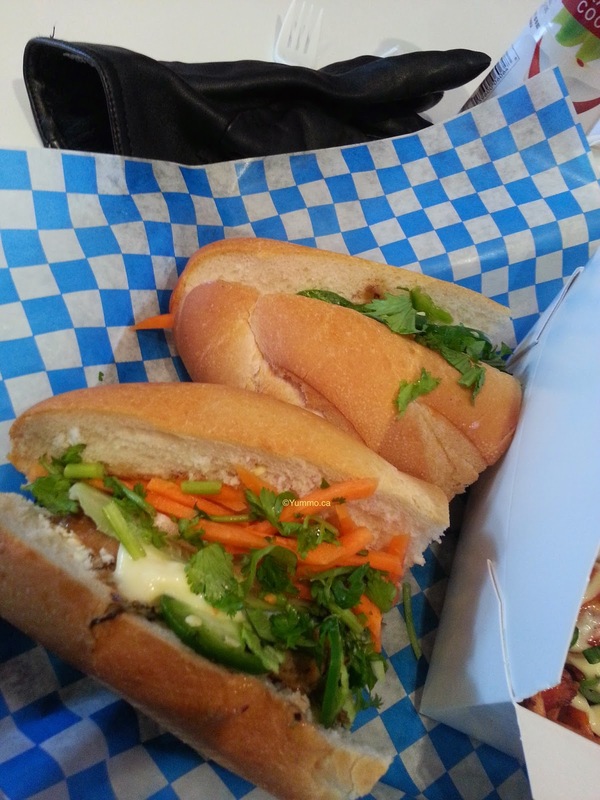 I got the Tofu Fries and the Lemongrass Tofu Bahnmi. I had wanted to get the Kimchee Fries but the menu read that it had Pulled Pork on it. It did not fully describe the Tofu Fries so I was very pleased to discover that the Tofu Fries were actually Kimchee Fries with Tofu instead of the Pork. 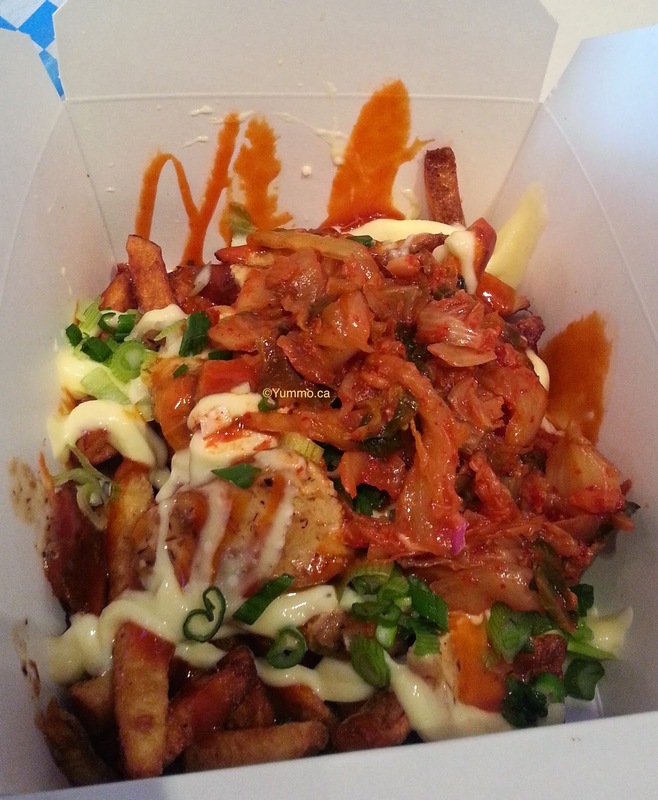 They are fresh fries with a nice sweet and tangy gochujang base sauce topped with Kimchee, Tofu and Scallions. The Kimchee tastes right and that's coming from someone who's mom not only makes 2 dozen of her own Kimchees but her own Gochujang, Fish Sauce, Soy Sauce and Miso. So yeah, it's good. They offer optional Mayo which I took and it added a nice creamy balance to the fries.